Mouse Neck Warmer.....or is it a Rat? When I started making items for my own ratties, people started telling me I should be making them to sell. What that means to you is that all of our items are rat tested and approved. I double stitch (at least double) where the weaker parts of items used need more strength. I use safe for rattie supplies while putting our sale items together. And I wear and wash what I sell. This item was inspired and designed by me. 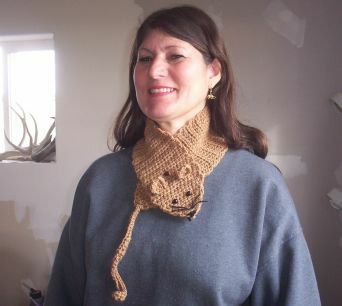 I got the idea from the beautiful and now in style hand crocheted and knitted neck warmers. The scarf has been hand crocheted stitch by stitch. It is approx. 29" long with an approx 9 1/2" tail and is about 4" wide. 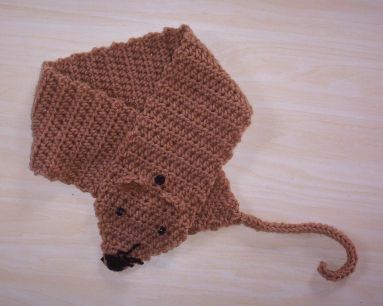 The rat is brown with black pony bead eyes and black yarn for the nose and whiskers. The ears stand out. The Neck Warmer has a small button so that the rat stays put around your neck...keeps you good and warm too. The button slips into anywhere in the scarf that fits your neck. The Scarf is hand or machine washable, hang to dry. Please Note: Our items are nonreturnable and not refundable. If there is a problem with craftsmanship we will be happy to replace the item. This item is new and has never been used by any animals. No animals have used or been around these items. The one I am wearing is *mine*. I have not worn any of the sales items. I also have a scarf in the PEW. Yes, I sell the earrings I am wearing in the photo here on our site too. Take a look. PURPLE BATS! Guinea Pig Dress HAPPY HALLOWEEN!